The influence of a degree in the job market, is something that has been seen to act as a ticket towards gaining a better-paying job. For these reasons, students have been striving hard to ensure they leave university with this important document. 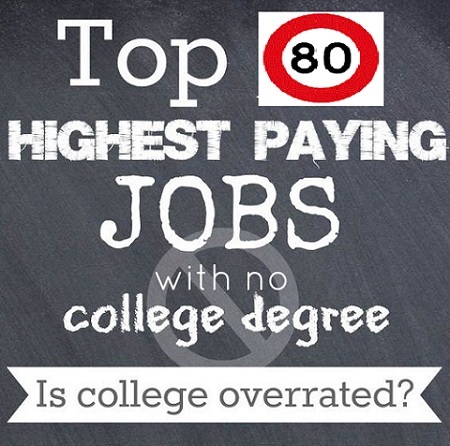 Luckily, you don’t have to own a degree to get a great paying job today. There are many people who are eating the fruits of their labor by working in jobs that didn’t require a college certificate before they were hired. This should come as a sigh of relief to the thousands of students who subject themselves to rigorous learning so that they may obtain a degree in their respective field. Looking for a great job without a degree is something that has happened to many people. Many hard-working citizens in the world, at one time or the other have landed in high-paying jobs that didn’t require a degree in the first place. This is further made easy by the availability of these jobs in the market today. One can research on the internet and be opened to so many different jobs they can choose from depending on their skills and merits. Another thing that you should know is that looking for a great job without a degree is an easy task as long as you have the skills. A lot of employers, before deciding to hire a person, will often want to know the level of knowledge or skill one possesses for doing a certain job. Having the skills needed for a particular job is very important and is one of the main things prospective employers look for before hiring a person. If you don’t have a degree to show for, then you must have some skills to show that you are the right person they are looking for. By all means, this is not to show that a degree is irrelevant. A degree is a document offered in universities to demonstrate the amount of education the holder has obtained in their studies. Though it may attract you, more job interviews and many job offers, there are some companies that will avoid hiring these highly educated individuals. In the past, many of us have witnessed people with degrees requesting a very high salary from prospective employers who make them reluctant to hire their services. Finally, gaining a job is a very important thing that can happen to a person. This serves by providing someone a source of livelihood and a means to earn their daily bread. Depending on the person, one can choose to be what they want in life. Whether you want to hire others or maybe want to be hired it remains a decision that is open to each person. To make it to the top you are required to have a plan, and then you can do anything. Don’t miss: What Do Employers Want from job seekers? What do you think about this post? Do you think one can land a good paying job without a university degree? Share your thought in the comment.